Br. Arthur Senecal, CSV, died Dec. 26, 1904 from complications related to pneumonia. He was 51. Br. Senecal was born Jun. 9, 1853 near Saint-Timothee, in Quebec, Canada. He attended the local parish elementary school and a Viatorian commercial college. He entered the Viatorian novitiate in Joliette in 1869 and professed his first vows on July 27, 1870. After renewing his original vows in 1875, he professed his perpetual vows on Jul. 27, 1880. During this time, he taught at Vercheres, Aylmer and Boucherville and became the director at a school in Pointe auz Trembles from 1877-1881. During these years, Br. Senecal’s health began failing and he made the inevitable shift from teaching to administration. In Aug. 1881, Br. Senecal was transferred to America, where he assisted the treasurer of St. Viator College in Bourbonnais. Despite repeated illness and increased weakness, Br. Senecal continued to work. 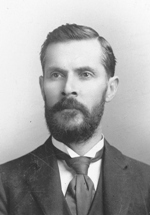 In Sept. 1890, he assumed the role of college treasurer due to his calm, informed opinions and administrative skill. Br. Senecal was constantly referred to by his colleagues as “le bon Frère Senecal,” or the good Br. Senecal. In 1901, he was relieved of several tasks in order to lighten his load, but his health did not improve. He was then sent various places with warmer climates, including Colorado, Florida and Arizona to relieve his symptoms, but pneumonia developed and ultimately led to his untimely death. Br. Farrell was buried beside his confreres in the Viatorian plot at Maternity BVM Cemetery in Bourbonnais.